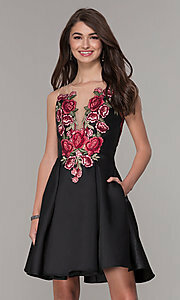 Bold floral embroidery on the bodice sets this short homecoming dress apart. 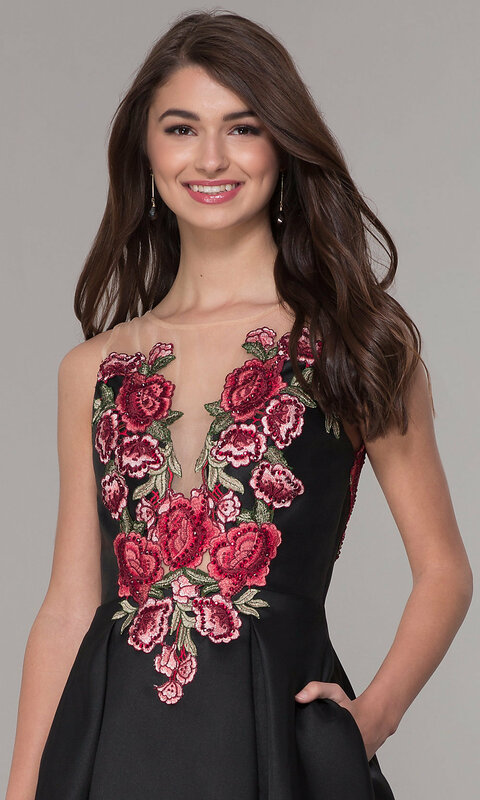 Multi-colored floral embroidered applique against sheer mesh fabric forms the sleeveless bodice of this adorable party dress. The detailed applique embellishes the little black dress along the illusion-inset deep v-neckline and sheer v-back. Box pleats create fullness on the short skirt, while side pockets add to the appeal. For homecomings, bar mitzvahs, and more, this homecoming party dress gets a super-cute rating with a look that demands attention.